American service members, and their families, are all American heroes. Each man and woman in the U.S. military can take pride in knowing they serve in the company of heroes. The men and women highlighted here are contemporary American Heroes, to whom each of us owes a tremendous debt of gratitude. These modern day heroes exemplify the very best of America, and personify the American Spirit. Without their sacrifices, we could not enjoy the many freedoms we treasure as American citizens. So, to these national heroes, and their families, we owe our eternal gratitude. We pay tribute here to let them and their families know we recognize and appreciate their sacrifices, and to let you know more about these men and women who freely give to secure your freedom. and especially, here at home." 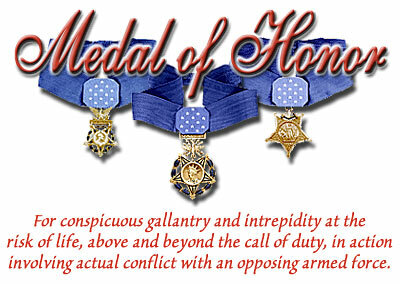 About the Medal of Honor. Army Lt. Audie Murphy, MOH, recipient of every award for valor bestowed by the United States of America. Army SSG Salvatore Giunta is the first living recipient of the Global War on Terror. 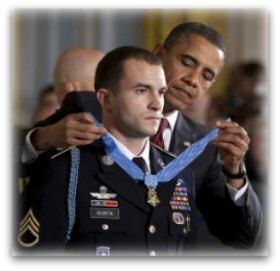 Giunta was presented the award by President Obama at the White House for his actions on October 25, 2007, in the remote Korengal Valley in northeast Afghanistan. In the face of "withering enemy fire" from an enemy ambush, and with no regard for the danger to himself, then-SPC Giunta chased after and engaged two Taliban fighters who were dragging away a seriously wounded SGT Joshua Brennan. Giunta shot both men, killing one. The wounded fighter dropped Brennan and ran. Giunta then dragged Brennan to a place of cover and began administering first aid, calling for medevac. SSGT Giunta's action turned the tide of the battle and saved the lives of his fellow soldiers. Navy SEAL (SEa, Air, Land) Lt. Michael P. Murphy, 29, was posthumously awarded the Medal of Honor for his heroic actions in Afghanistan on June 28, 2005. Murphy is the first service member to be awarded the Medal of Honor for combat action in Afghanistan in support of Operation Enduring Freedom, and the first Navy SEAL since WWII to receive the MOH. 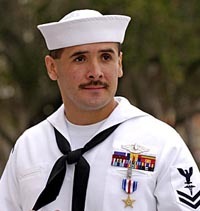 He is also the first Navy service member to receive the Medal of Honor for actions in the Global War on Terror and the third armed forces service member to receive the Medal of Honor since the beginning of Operations Enduring Freedom and Iraqi Freedom. Lt. Murphy was killed by enemy forces during a reconnaissance mission, Operation Redwing. He led a four-man team tasked with finding a key Taliban leader in the mountainous terrain near Asadabad, Afghanistan, when they came under fire from a much larger enemy force with a superior tactical position. The US Navy has announced its newest Arleigh-Burke-class destroyer will be named USS Jason Dunham in honor of Corporal Jason Dunham, the most recent Marine Medal of Honor recipient. Corporal Dunham died at Bethesda Naval Hospital in April 2004, at age 22, eight days after throwing himself on top of a live grenade to save his fellow Marines. President Bush announced the Medal of Honor award at the dedication of the National Museum of the Marine Corps in November 2006, which coincided with the 231st Marine Corps anniversary and what would have been Corporal Dunham's 25th birthday. Corporal Dunham's parents were in the audience at the ceremony. Corporal Jason Dunham's mother has a message for today's troops. Army Sgt. 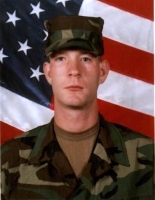 First Class Paul R. Smith was posthumously awarded the Medal of Honor for his actions in the opening days of Operation Iraqi Freedom. Smith died in the firefight to capture Baghdad's airport from Saddam Hussein's forces in April 2003, while saving 100 of his fellow soldiers. In a letter he had written to his parents that had not been mailed at the time of his death, the sergeant called it a "privilege to be given 25 of the finest Americans we call soldiers to lead into war." He said he was prepared to give "all that I am to ensure that my boys make it home." And he did. President Bush presented the medal to Smith's 11-year-old son David, while his 18-year-old daughter Jessica and widow Birgit looked on. Retired Army Lt. Col. Bruce Crandall was awarded the Medal of Honor, 41 years after his heroic actions in Vietnam. Crandall's helicopter flights into the Ia Drang valley, known as the "Valley of Death," to rescue and resupply ground troops were depicted in the movie "We Were Soldiers Once . . . and Young." In announcing the award, President Bush noted that, with humility typical of Medal of Honor winners, Crandall had actually removed his own name from consideration for the medal to ensure that his co-pilot, then-Captain Ed Freeman , received it. Freeman's Medal of Honor was presented by President Bush in 2001. The Silver Star, the nation's third highest award for gallantry in combat, is awarded to a person who, while serving in any capacity with the U.S. military, is cited for gallantry in action against an enemy of the United States, while engaged in military operations involving conflict with an opposing foreign force, or while serving with friendly foreign forces engaged in armed conflict against an opposing armed force in which the United States is not a belligerent party. Army medic Corporal Angelo Vaccaro is the first soldier to receive not one, but two Silver Stars in the War on Terror. Assigned to the 10th Mountain Division, Cpl Vaccaro died in Afghanistan in October 2006, while trying to save the lives of other injured soldiers in his unit. He was not on patrol, but back at the base, when he heard over the radio that his unit had been attacked, and some of his men had been injured. Ignoring the risk to his own life, Cpl Vaccaro volunteered to attempt an extremely dangerous extraction of the wounded soldiers despite fierce enemy fire. Corporal Vaccaro was an outstanding example of the value of the military's "waivers" program, which permits individuals who are otherwise disqualified to serve, following review of their applications on a case-by-case basis. After a troubled youth, including minor brushes with the law, Vaccaro followed his older brother into the Army "to turn his life around." And he did just that. Hailed as a hero by other members of his unit, Corporal Vaccaro made a lasting impact in their lives. Corporal Vaccaro's heroism and dedication to his fellow soldiers was recognized recently when the new Warrior Transition Brigade building at Walter Reed Army Medical Center was renamed Vaccaro Hall in his honor. His name had earlier been placed on a medical training building at Fort Drum, NY. 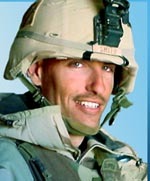 Petty Officer Second Class Marc Alan Lee, USN (SEAL), 28, became the first Navy SEAL killed in the war in Iraq on August 2, 2006, in an hour-long firefight in the streets of Ramadi. He created an offensive diversion to aid in the evacuation of a wounded teammate, exposing himself to enemy fire. His citation for the Silver Star Medal (awarded posthumously) reads in part,"During the operation, one element member was wounded by enemy fire. The element completed the casualty evacuation, regrouped and returned onto the battlefield to continue the fight." "Petty Officer Lee and his SEAL element maneuvered to assault an unidentified enemy position. He, his teammates, Bradley Fighting Vehicles and Abrams tanks engaged enemy positions with suppressive fire from an adjacent building to the north. "To protect the lives of his teammates, he fearlessly exposed himself to direct enemy fire by engaging the enemy with his machine gun and was mortally wounded in the engagement. His brave actions in the line of fire saved the lives of many of his teammates." PO Lee was also awarded the Bronze Star Medal and the Purple Heart. Army Spc Monica Brown, a 19-year-old medic from Lake Jackson, Texas, has become the second woman since World War II to receive the Silver Star Medal for Gallantry in combat. As the medic traveling with a four-vehicle convoy in eastern Afghanistan in April of 2007, she is credited with saving the lives of five wounded soldiers after their Humvee was struck by an IED. Navy Petty Officer 2nd Class Juan Rubio was awarded the Silver Star Medal, the nation's third highest award for gallantry in combat, for actions while serving as a medical corpsman with a Marine platoon in Iraq. After his unit was ambushed, Rubio crawled across open terrain, risking his own life to increasing enemy fire. While bleeding profusely from his own injuries, he simultaneously provided care for three urgent surgical casualties and coached fellow Marines in assisting other casualties, all under continually intensifying enemy fire. Sgt. Leigh Ann Hester, at age 23, is the first female soldier to receive the Silver Star Medal in direct combat action against the enemy. Sgt Hester is assigned to the 617th Military Police Company, a National Guard unit from Richmond, Ky. Hester and two other members of her unit, Staff Sgt. Timothy Nein and Spc. Jason Mike, were awarded the Silver Star for their actions during an enemy ambush on their convoy in Iraq in 2005. Staff Sgt. Nein's medal was recently upgraded to a Distinguished Service Cross, second only to the Medal of Honor. Army Reserve Spc. 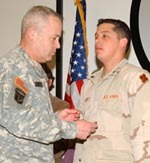 Jeremy L. Church earned the first Silver Star awarded to an Army reservist in the global war on terror. Spec. Church, assigned to the 724th Transportation Company, from Bartonville, Ill., saved the lives of his commander and other soldiers when their 26-vehicle convoy came under heavy fire while making an emergency delivery of fuel to Baghdad Airport in April 2004. Church was driving the lead vehicle when the convoy was attacked, and the convoy commander, 1st Lt Matt Brown, was shot in the face. Then-Pfc Church maneuvered his vehicle with one hand, while using the other to fire his M-16 at insurgents, to get Lt Brown to the perimeter, 15 minutes away, where he was medevac'ed for immediate medical treatment. Church returned to the firefight. The Distinguished Flying Cross is awarded to any person who, while serving in any capacity with the Armed Forces of the United States, distinguishes himself or herself by heroism or extraordinary achievement while participating in aerial flight. The performance of the act of heroism must be evidenced by voluntary action above and beyond the call of duty. The extraordinary achievement must have resulted in an accomplishment so exceptional and outstanding as to clearly set the individual apart from his/her comrades or from other persons in similar circumstances. Awards will be made only to recognize single acts of heroism or extraordinary achievement. Marine Major William D. Chesarek, Jr., USMC, was awarded the United Kingdom's Distinguished Flying Cross by Queen Elizabeth II in a ceremony at Buckingham Palace. He is the first American to be so honored since World War II. Major Chesarek was serving an exchange tour with a British Lynx helicopter unit in Iraq when he earned the UK's number three award for gallantry in action. Chesarek's wife Christine, who is a US Navy nurse, and their 2-year-old son William were present for the award ceremony, as were the Major's parents. In reflecting on the award, Major Chesarek said, "My greatest sense of achievement that day is in knowing the ground troops all made it home." Air Force Capt. Kim Campbell, call sign "Killer Chick," was awarded a Distinguished Flying Cross for her actions as the pilot of an A-10 Warthog in the opening days of the fight for Baghdad in April 2003. After Capt. Campbell and her wingman had accomplished their mission and turned back to base, her Warthog was rocked with a violent explosion. Despite her hydraulic system having been rendered inoperable, and with numerous caution lights flashing, Capt. Campbell elected to try to manually fly her aircraft the 300 miles back to base instead of bailing out over hostile terriroty. Upon safely landing at base, she discovered that one of her engines was badly damaged and the aircraft fuselage was riddled with hundreds of bullet holes. The Bronze Star Medal is awarded to any person who, while serving in any capacity in or with the military of the United States after 6 December 1941, distinguished himself or herself by heroic or meritorious achievement or service, not involving participation in aerial flight, while engaged in an action against an enemy of the United States; while engaged in military operations involving conflict with an opposing foreign force; or while serving with friendly foreign forces engaged in an armed conflict against an opposing armed force in which the United States is not a belligerent party. Marine Major Doug Zembiec, hailed by his men and honored by Secretary of Defense Robert Gates as the "Lion of Fallujah," was awarded the Bronze Star for his actions in Iraq. Zembiec was a Marine Company Commander in the hard-fought battle for Fallujah in the opening days of the war in Iraq in April 2004. His men were on a rooftop, taking rocket-propelled grenades from all directions. Unable to reach the crew of a tank he was requesting to fire on the insurgents, and ignoring the personal risk to himself, Zembiec took matters into his own hands. He raced down the stairs, into the line of fire, climbed up onto the tank, and told the gunner where to fire. Miraculously, he was unhit. He returned to his men and resumed the fight. After returning from Iraq, he was assigned to a desk job in the Pentagon, but quickly chafed at desk duty. He volunteered to return to the battlefield in Iraq. Major Zembiec left behind a wife and a 1-year-old daughter. When he was laid to rest at Arlington National Cemetery, the crowd of more than 1000 included many enlisted Marines from his beloved Echo Company. As an officer there commented to a reporter: 'Your men have to follow your orders; they don’t have to go to your funeral.' Zembiec was an inspiration to those men of Echo Company, and to all of us. 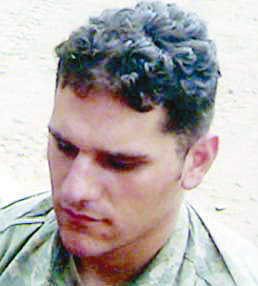 U.S. Army Sergeant Andrew Joseph (AJ) Baddick, of Jim Thorpe, Pennsylvania, drowned near Baghdad on September 29, 2003, as he attempted to rescue another soldier whose humvee had veered into a canal. Baddick was a river rafting guide and volunteer firefighter, so it was no surprise to those who knew him that he unhesitatingly jumped in to try to save the occupants of the Humvee. Two of the men were able to get out on their own. Baddick jumped in and pulled one man from the canal, and then went back for the driver, who was swept into a culvert under a highway. Baddick and the driver both drowned. Baddick was posthumously awarded the Bronze Star Medal and the Soldier's Medal for heroism. The Soldier's Medal is awarded to any person of the Armed Forces of the United States or of a friendly foreign nation who, while serving in any capacity with the Army of the United States, distinguishes himself or herself by heroism not involving actual conflict with an enemy. It is awarded for risking one's life to save that of another. Notable recipients of the Soldier's Medal include former Secretary of State General Colin Powell, U.S. Army (retired). For an awesome video tribute to heroes of OEF and OIF, go to www.patriotfiles.org, published by a retired Navy officer. 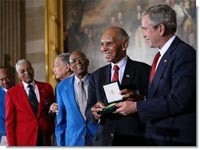 President Bush bestows the Congressional Gold Medal, the highest civilan award it can authorize, upon the Tuskegee Airmen. Saying he wanted to “offer a gesture to help atone for all the unreturned salutes and unforgivable indignities,” Bush held his straightened right hand to his brow and saluted the airmen. After returning his salute, the airmen remained standing and applauded. Speaking on behalf of the Tuskegee Airmen, Dr. Roscoe Brown, a former commander of the 100th Fighter Squadron, 332nd Fighter Group, thanked Bush and the House and Senate for “voting unanimously to award this medal collectively to the pilots, bombardiers, the navigators, the mechanics, the ground officers, the enlisted men and women who served with the Tuskegee Airmen.” Brown, who received a Distinguished Flying Cross and was the first U.S. pilot to down a German Messerschmitt jet, said that the Tuskegee Airmen are very pleased to have been in the forefront of the struggle for freedom and justice in this country. For those born after 1970, and those not familiar with US Air Force History, or World War II history, who may not have heard of them, the Tuskegee Airmen were a select group of black Americans who served with distinction in the US Army Air Corps during World War II. Rep. Charles Rangel, who supported the bill through the House of Representatives, highlighted some of the discrimination against these airmen because of the color of their skin, a result of the social climate in this country at the time. “From a nation that had rejected you because of your color, said you couldn’t fly, said you just weren’t worthy, you had to go out there and prove to them just how wrong they were." Among the achievements of the Tuskegee Airmen: 15,000 combat sorties flown, by 1,000 black pilots, 260 enemy aircraft destroyed, 150 Flying Crosses and Legions of Merit earned, and more than 700 Air Medals and clusters earned. Former U.S. Secretary of State and retired Gen. Colin L. Powell recognized additional African-American groundbreakers, the Golden 13, the Montford Point Marines and the 555th Paratroopers -- the Navy, Marine, and Army counterparts, respectively, of the Tuskegee Airmen. The father of ABC's Good Morning America anchor Robin Roberts was one of the Tuskegee Airmen. If you know of an American Hero you'd like to nominate for inclusion here, please let us know via our contact page.